Pioneers in the industry, we offer 3rd party manufacturer of herbal products from India. 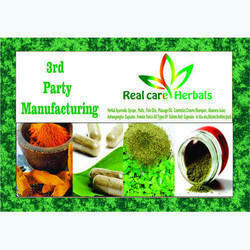 Leveraging on our extensive market knowledge, we are providing high-quality 3rd Party Manufacturer Of Herbal Products. We provide all the backhand support to startup companies in processing medicines with low investment. Therefore, the imparted service is highly appreciated by the clients who have joined with us and are benefiting from us. In addition, we also render our third party manufacturing service to our valuable clients at affordable prices.